Hey, we are Allen & Zinny, a husband and wife team primarily shooting weddings. We have always been lovers of art. Allen discovered his love for art at a young age so photography and videography eventually came easily to him. Zinny, on the other hand, loved writing and everything artsy. While we love to photograph lifestyle, documentary, and portraits, we found out that weddings give us the opportunity to mix beauty, art and the story between our couples in pure candid documentary fashion. We will work closely with you to create a relationship, so by the time we take pictures or videos on your wedding day, you probably won’t notice that we are around capturing valuable moments that you never thought could be captured. Check out our blog and gallery where we share previous wedding pictures and videos we’ve shot at, as well as wedding tips, tricks and more. We are located in Toronto, Ontario but shoot for clients in the Greater Toronto Area as well as destinations outside of Toronto. 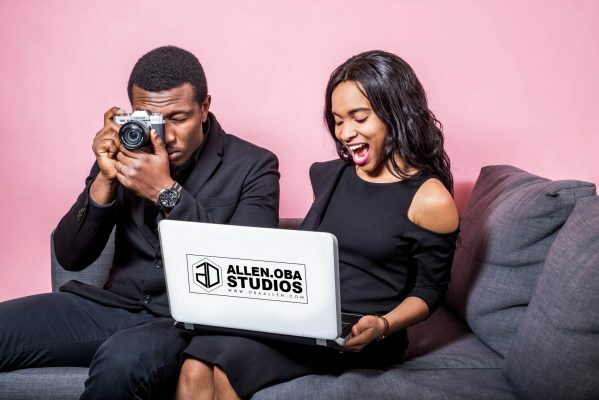 To book an appointment with us, call/ text: +1 416 436 0401 or send an email to allenobastudios@gmail.com. We can’t wait to hear from you! We focus on telling stories regardless of what we shoot. Our pictures showcases the awesomeness of locations, the beauty in people, and the love stories in weddings. We work hard to plan out how your videos will come out even before shooting, so when we arrive at your wedding we mix our storyboard with the candid moments happening to create outstanding wedding films.